If you’re shopping for a mirrorless camera, you’ve come to the right place! Mirrorless is the most exciting development in cameras since the birth of digital photography, and on this page I’ll highlight my favourite models! Mirrorless cameras can pack the quality, control and flexibility of a DSLR with their large sensors, exposure adjustment and interchangeable lenses, but by dispensing with the mirror, have the potential to be smaller, lighter, quieter and faster. Since they use their main imaging sensor for focusing, they also have the potential to track and focus subjects right into the corners while also exploiting face and sometimes even eye-detection. With 100% electronic composition, you’ll also be able to use a viewfinder for everything you’d see on the screen, including playing images, assisting focus, previewing effects, white balance and colour adjustments, as well as filming and playing movies, and even navigating menus – all much easier in bright conditions than using the screen, not to mention more comfortable for those who are longer-sighted. The best mirrorless cameras have also banished performance issues of early models and now boast viewfinders with large, detailed images, not to mention focusing and burst shooting capabilities that most DSLRs can only dream of. Compared to a DSLR there’s inevitably greater power consumption, so batteries won’t last as long, but the latest models are certainly catching-up. For me, mirrorless cameras are more compelling than DSLRs in almost every category and price-point, and I personally made the switch ten years ago when Panasonic and Olympus launched Micro Four Thirds, later supplementing my collection with Fujifilm and Sony gear. Here are my recommendations! Like DSLRs, most manufacturers have developed their own mirrorless system with a lens mount that’s not compatible with rival systems. There’s Sony’s e-mount which is designed for APS-C or full-frame bodies. There’s Fujifilm’s X-mount, designed for APS-C sensors. Canon has EF-M for APS-C bodies and RF for full-frame. Nikon has the Z-mount for full-frame. The exceptions are two alliances: Micro Four Thirds and L-mount. The former employs a Four thirds sensor that’s a little smaller than APS-C and was co-developed by Panasonic and Olympus who share the same mount, allowing them to use each other’s lenses, as well as third party models designed for the system. The second alliance is L-mount, based on Leica’s full-frame system, but now partnered with Panasonic and Sigma who are both committed to releasing full-frame bodies and lenses, all of which will be compatible with each other. I’ll be recommending a mix of all formats in each category. Mirrorless cameras start around the $400 price, for which you’ll get a camera with an APS-C or Four Thirds sensor, a basic kit zoom lens and manual control; most will also have wifi to connect to your phone, but at this price you won’t generally get a viewfinder, so you’ll be composing with your screen only. 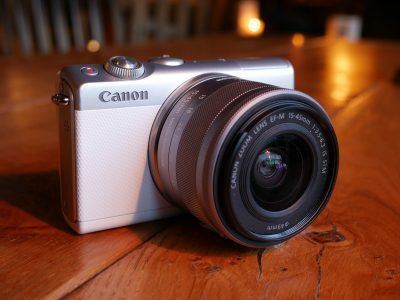 One of the cheapest budget mirrorless cameras worth having is the Canon EOS M100 which sports a 24 Megapixel APS-C sensor, confident focusing, Wifi and a tilting touchscreen which can tilt-up to face you – not only is it a solid all-rounder, but it’s also an ideal entry-point for vlogging; see my Canon EOS M100 review for more details. Priced a little higher is the Panasonic Lumix GX800 / GX850 which may have a slightly smaller and lower resolution 16 Megapixel Four thirds sensor and focusing that’s less confident for action, but it’s the cheapest camera with 4k video (and Panasonic’s clever 4k Photo modes) if that appeals to you. The Micro Four Thirds lens mount also has access to a wide range of lenses; see my Panasonic Lumix GX800 / GX850 review for more details. Priced a little higher still is the Fujifilm X-T100 which packs a 24 Megapixel APS-C sensor with good autofocus, a touchscreen which angles-out to face you, as well as being one of the cheapest models you’ll find with a built-in viewfinder and a microphone input (albeit one which will need an adapter plug for most microphones. As a Fujifilm X camera, you’ll also enjoy their lovely photo processing as well as access to a wide selection of native lenses; see my Fujifilm X-T100 review for more details! Most budget cameras aren’t great for fast action photography, but an exception is the Sony A6000 which may now be several generations old, but can handle sports, action or simply active kids and pets better than anything else for the money – and it also sports a 24 Megapixel APS-C sensor and a viewfinder. Look out for good discounts. The mid-range category, starting at around $700, is where things start to get more interesting as they normally include a viewfinder and a microphone input which can greatly improve your audio quality for movies. One of my favourite mid-range mirrorless cameras is the Canon EOS M50 which packs a 24 Megapixel APS-C sensor with great autofocus, a fully-articulated touchscreen, built-in viewfinder, Wifi and microphone input into a very compact body – again a great all-rounder that’s ideal for vlogging, although think of its video as being 1080 only as its 4k mode is too cropped to be useful; see my Canon EOS M50 review for more details. Above: Canon’s EOS M50 is one of the best mid-range mirrorless cameras around. 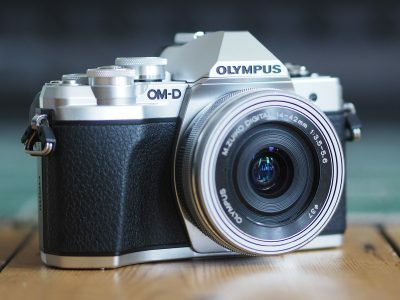 If you like the retro-aesthetic, also consider the Olympus OMD EM10 III, an attractively-styled body with a slightly smaller 16 Megapixel Four Thirds sensor. The resolution and focusing may not be as good as others in this category but it does have excellent built-in stabilisation that works with any lens as well as access to the broad Micro Four Thirds lens catalogue – as an older model, look out for discounts. Also consider the Panasonic Lumix G80 / G85, again with the 16 Megapixel Four Thirds sensor, but a fully-articulated screen, viewfinder and 4k video; see my Olympus OMD EM10 III review for more details. Priced a little higher is the Fujifilm X-T30, a classy-looking retro-styled model with a 26 Megapixel APS-C sensor, excellent autofocus, a built-in viewfinder and Wifi; there’s also a mic input although you’ll need an adapter for it to work with popular models. There’s no built-in stabilisation, the screen won’t flip to face you, but you do get Fujifilm’s lovely photo processing, most of the video and AF capabilities of the flagship X-T3, as well as access to the best selection of native APS-C lenses – it’s a great choice for someone who wants to start building a serious system without breaking the bank; see my Fujifilm X-T30 review for more details, and also keep an eye for discounts on the earlier Fujifilm X-T20; see my Fujifilm X-T20 review for more details. For much the same price as the X-T30, you could alternatively get the Sony A6400, its latest body with a 24 Megapixel APS-C sensor. The body is essentially the same as the earlier A6300, so sadly there’s still no built-in stabilisation, but finally the screen can angle up by 180 degrees to face you for vlogging or selfies. Video shooters will also appreciate the unlimited recording time, as the A6400 is one of the few models to allow clips longer than half an hour even in 4k. The A6400 features Sony’s latest autofocus tech including the best face and eye-detection around, coupled with fast continuous shooting. There’s also a mic input, although if you mount it on the hotshoe, you’ll block the flip-up screen. Check out my Sony A6400 review for more details. Beyond $1000 you’ve entered the high-end category where cameras with Four Thirds or APS-C sensors become tougher and faster, targeting sports and action, or at least very active kids and pets. Video features become better too with less cropped footage and higher frame rates. You’ll also begin to see older models with larger full-frame sensors, discounted to clear stocks – indeed if you desire full-frame but can’t afford the latest models, keep an eye on the often-discounted, but still very respectable, Sony A7 II. 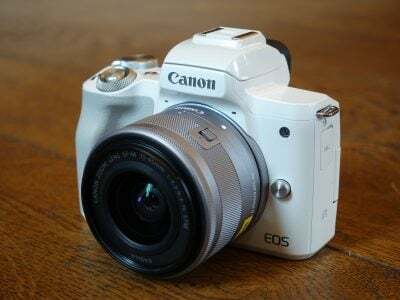 There’s also the Canon EOS RP, essentially a full-frame version of the EOS M50 with the 6D Mark II’s sensor – a good option for existing Canon owners looking to go full-frame or mirrorless; see my Canon EOS RP review for more details. For around the same price as the RP you could get the Panasonic Lumix G9, which may have a smaller 20 Megapixel Four Thirds sensor, but manages to deliver decent quality at all but the highest sensitivities. The continuous focusing isn’t quite as confident as its rivals, but it sports a bunch of modes which can capture action before you fully depress the shutter, not to mention a fully-articulated screen, built-in stabilisation, twin card slots, an enormous viewfinder image and 4k up to 60p – indeed it’s the cheapest camera to offer 4k 60p, making it a tempting choice for film-makers who can’t stretch to the GH5, or who like having the greater photo capabilities. 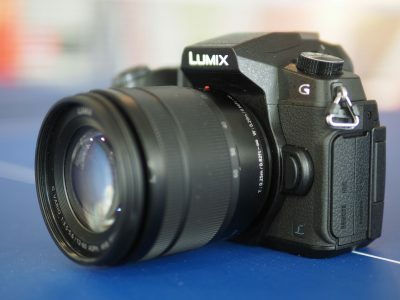 See my Lumix G9 review for more details. 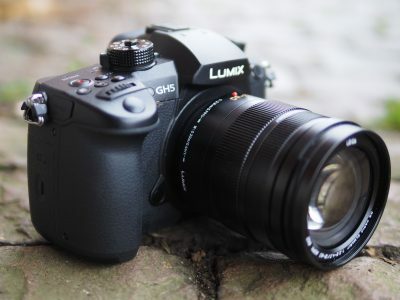 Next up is the Panasonic Lumix GH5, costing a little more than the G9, but delivering more professional video capabilities to high-end film-makers. It’s arguably the best pro video camera at its price point. At around the same price is the Olympus OMD EM1 II, another camera with a 20 Megapixel Four Thirds sensor and fully-articulated screen, but this time with more confident autofocusing for sports and wildlife. While the video isn’t quite as good as the Panasonics at this price, the EM1 II still captures very respectable footage and also has the best built-in stabilisation around. Also in a similar price range is the Fujifilm X-T3, another compact and retro-styled body with an APS-C sensor and Fujifilm’s renowned image processing, but this time coupled with the company’s best autofocusing and video capabilities yet, including confident focus across the entire frame and 4k up to 60p. If you love the style but don’t need the improved video and focus though, keep an eye on the price of the previous Fujifilm X-T2, discounted now that the newer X-T3 is available. Both have twin card slots too. See my Fujifilm X-T3 review for more details. Also consider the Fujifilm X-T30 if you fancy most of the X-T3’s photo, movie and autofocusing capabilities in a smaller, lighter and cheaper body – see my mid-range category above. Above: Fujifilm’s X-T3 combines retro aesthetic with cutting-edge technology. PS – for around the same price as the X-T3, there’s the Olympus OMD EM1 Mark II, an older model, but one still worth considering as it features great continuous autofocusing, 4k video, a fully-articulated touchscreen, and superb built-in stabilisation. 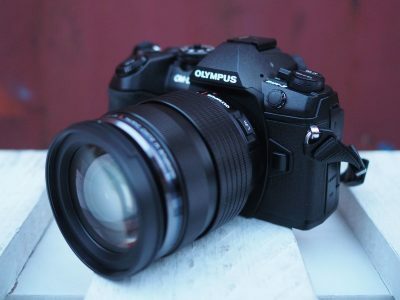 Like the Lumix G9, it employs a smaller Four Thirds sensor, but it still delivers decent quality at all but the highest sensitivities; see my Olympus OMD EM1 II review for more details. Next it’s a leap to the $2000 mark which opens-up the full-frame market. 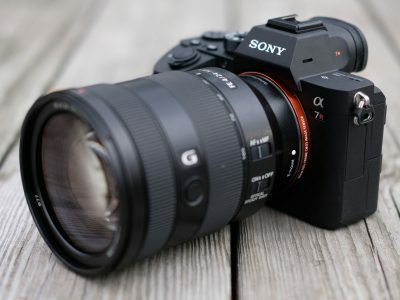 By far the strongest camera at this price point is the Sony A7 III, which packs a 24 Megapixel full-frame sensor with excellent autofocus, built-in stabilisation, fast burst shooting, great quality 4k video, eye-detection, twin card slots, decent battery life and a tilting touchscreen. It’s simply unbeatable at this price, and Sony’s range of full-frame lenses keeps getting broader; see my Sony A7 III review for more details. Note if you have an existing collection of Nikon F-mount lenses, you may prefer the Nikon Z6 which, for the same money, also has a 24 Megapixel full-frame sensor, decent 4k and built-in stabilisation. It may lack the ultimate feature-set of the Sony, but it will focus adapted Nikon DSLR lenses better. For a little more than the A7 III, there’s the Canon EOS R, this time with a 30 Megapixel full-frame sensor and the only model in its peer group with a fully-articulated touchscreen. Sadly the 4k video is heavily cropped and there’s also some unusual controls you’ll love or hate, but like the Nikon Z cameras, it does a sterling job autofocusing older DSLR lenses. So if you have an existing collection of EF lenses and want the best autofocus from them, then the EOS R is your best bet (although bear in mind EF lenses also adapt quite successfully to Sony bodies too). See my Canon EOS R review for more details. Beyond here we hit the $3000-plus mark with full-frame models like the Sony A7r III and Nikon Z7 which both capture stills with over 40 Megapixel resolution, plus are packed with other features I’ve detailed in my reviews – see my Sony A7r III review and Nikon Z7 review for more details. Like the A7 III and Z6 below them, the A7r III will out-perform, or at least out-feature, the Z7, but owners of existing Nikon DSLR lenses will prefer the Z7 for better compatibility with F-mount lenses via an adapter. Above: Sony’s A7r III is one of the best high-end mirrorless cameras. 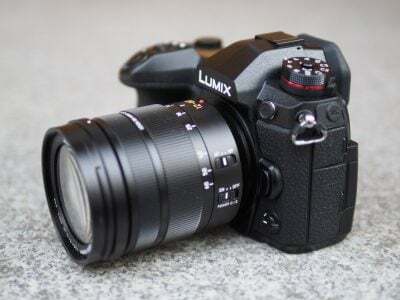 If you’re building a new full-frame mirrorless system, you should also consider the Panasonic Lumix S1R, the first new bodies from the L-mount alliance with Leica and Sigma. 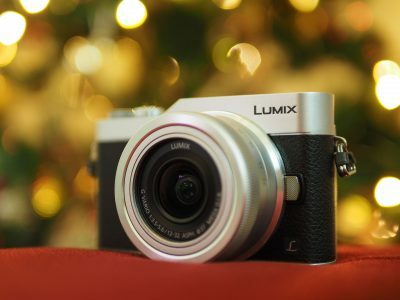 They should particularly appeal to video shooters and you can find out more in my Panasonic Lumix S1R review-so-far. Finally a very respectful nod to the Sony A9 which may be priced above all the models above, but out-performs professional sports DSLRs costing comfortably more. If you want a glimpse of the future with a camera that shoots silently at up to 20fps with supremely confident autofocus, zero viewfinder blackout and minimal distortion from the electronic shutter, the A9 is the camera for you. See my Sony A9 review for more details. The Fujifilm X-T30 follows a tried-and-trusted recipe now on its third generation, delivering the same sensor, processing and autofocus of the flagship X-T3 in a smaller, lighter and much more affordable body. 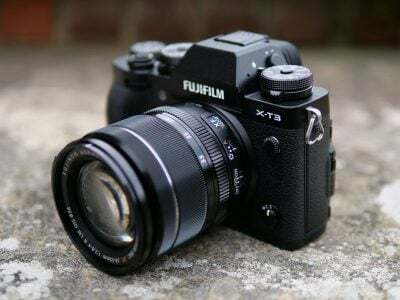 As such it becomes the second body to feature Fujifilm’s latest 26 Megapixel / APSC / X-Trans IV sensor with 100% phase-detect autofocus coverage and electronic bursts up to 30fps with optional pre-burst capture too. It may lack the X-T3's weather-proofing, twin card slots, larger and higher resolution viewfinder, 4k up to 60p and screen that angles sideways as well as vertically, but it boasts a popup flash absent from the flagship, and now includes an AF joystick too. Compared to rivals, it lacks built-in stabilisation, 4k movie clips longer than ten minutes, a standard 3.5mm mic input (instead continuing to force you to adapt the 2.5mm jack), and a card slot that can exploit UHS-II card speeds. 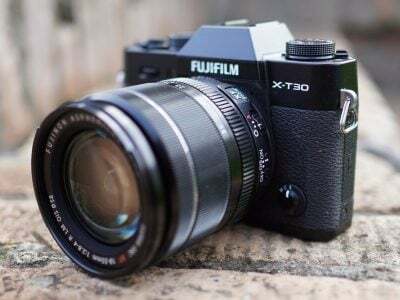 But as a general-purpose body, the X-T30 remains a great choice, not just against new rivals but also as an upgrade for the earlier X-T20 and even the X-T2. Check prices on the Fujifilm X-T30 at Amazon, B&H, Adorama or WEX! Sony’s A6400 is a solid mid-range mirrorless camera with an APSC sensor delivering good quality 24 Megapixel photos and 4k video. Improvements to the autofocus system mean it’ll track and stay focused on subjects more successfully than any camera at its price point whether you’re shooting stills or filming video, and fast burst speeds mean it’s also better-suited to action than most rivals too. The screen can finally flip-up by 180 degrees to face you for vlogging, and the rare ability to keep filming beyond half an hour makes it ideal for interviews and events. Frustratingly if you fit a microphone to the hotshoe, you’ll block the screen, but you could always use a bracket or a cabled microphone instead, and while there’s no headphone jack or dual card slots, that’s normal at this price. I’d have liked to see a better battery, but you can at least power the camera over USB which is useful for long videos or time-lapses which have also been reinstated after the loss of downloadable apps. Arguably the biggest downside is the lack of built-in stabilisation which remains exclusive to the A6500 in Sony’s APSC range - annoying since it’s long been standard across Sony’s full-frame line. If you do need IBIS, perhaps for unstabilised primes, then the A6500 is still tempting even at a higher price, but I personally prefer the A6400 for its improved focusing, longer recordings and selfie-screen even with the hotshoe limitations. Since the previous A6500 followed the A6300 by only 8 months though, It does beg the question whether there’ll be a stabilised version of the A6400 in the future, although presumably at a premium you may not be willing to pay. Plus if you don’t need the A6400’s upgrades, look out for discounted A6300s, and if you don’t need 4k or fast bursts, Canon’s EOS M50 remains a great option for vloggers with a side-hinged screen and lower price. But personally speaking, the A6400 fits very well with my style of filming and lack of IBIS aside, it’s a strong camera at the price point I’m happy to recommend. Fujifilm’s X-T3 is a highly satisfying mirrorless camera and my favourite model in the X-series. It may look a lot like the earlier X-T2, but Fujifilm’s latest 26 Megapixel X-Trans IV sensor brings big improvements to autofocus (now across the entire frame), burst speed (up to 11fps mechanical or 30fps electronic), and especially to video (4k up to 60p with 10-bit internal recording). Indeed the X-T3 becomes the best APSC camera for video to date and will confidently take on the Sony A6300 / A6500 for action shooting too. On the downside there’s no built-in stabilisation, fairly average battery life, and skewing restricts the usefulness of the electronic shutter modes; vloggers will also wish it had a screen that flipped forward. That said I still personally feel the X-T series strikes the perfect balance of size, style and usability, and while I miss IBIS and would prefer a bigger battery, I wouldn’t want them if they made the body any larger. Again it’s all very personal, but I find the X-T series one of the most satisfying to shoot with: attractively-styled, tactile controls, small enough to never leave at home, and crucially delivering images (and now also video files) that look great out-of-camera, requiring little or no post-processing. If you won’t exploit the improvements to autofocus, burst speed or video, then the previous X-T2 remains a tempting option if you can find one at a lower price, but for me the X-T3 becomes one of my favourite all-round cameras and one that easily takes-on full-frame rivals; Highly Recommended. Check prices on the Fujifilm X-T3 at Amazon, B&H, Adorama, or Wex. Alternatively get yourself a copy of my In Camera book or treat me to a coffee! Thanks! The Canon EOS M50 is an upper entry-level mirrorless camera with a 24 Megapixel APSC sensor, confident autofocus (for stills and 1080p video), small but crisp OLED viewfinder, excellent wireless, and becomes Canon's first mirrorless with 4k video, a fully-articulated touch-screen, eye detection and silent shooting options. Sadly the 4k is of limited use, employing a severe crop and only working with less confident contrast-based autofocus. I'm also frustrated there's no USB charging, especially since the battery is fairly weak. But these aside, the EOS M50 remains a highly compelling model with a compact but comfortable body, effective touchscreen, industry-leading wireless, confident focusing for 1080p video, and great colours out-of-camera. Indeed the M50 may be pitched as an upper entry-level model, but I reckon it's Canon's most compelling mirrorless to date. 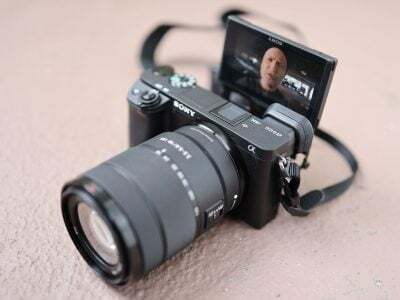 Coupled with a hotshoe and microphone input, the M50 will be as popular with vloggers as it is with those looking for an upgrade from smartphone photography. Recommended. The Sony Alpha A7 III is a highly versatile and feature-packed camera that redefines what we can expect from a full-frame body at this price point. It delivers crisp and satisfying images from its 24 Megapixel full-frame sensor, captures good-looking 4k video in either full-frame or cropped APSC modes, handles itself confidently for action with 10fps bursts and phase-detect autofocus across almost the entire sensor, while also being ideal for events with excellent face and eye detection as well as the chance to shoot in genuine silence. Pros shooting one-off occasions will appreciate the security of twin SD card slots, studio shooters will enjoy the high speed tethering and USB power, while travellers and social photographers will love the Wifi and seamless location tagging over Bluetooth. 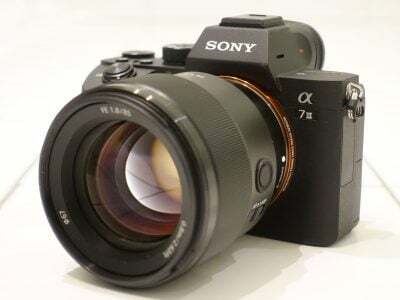 Oh and as a third generation Sony A7 model, the A7 III also enjoys the better controls and bigger battery of the A7r III which essentially banishes previous concerns over mirrorless. For anyone desiring full-frame, the A7 III could be all the camera you need and also the model to tempt many DSLR owners into switching. Check prices on the Sony A7 III at Amazon, B&H, or Adorama, or Wex. Alternatively get yourself a copy of my In Camera book or treat me to a coffee! Thanks! The Lumix G9 is a confident high-performance camera that's a joy to use. The tough weatherproof body feels great in your hands with excellent controls, there's an enormous viewfinder image, a fully-articulated touchscreen with an excellent user interface, fast autofocus and burst shooting that can track action, very effective built-in stabilisation, and great image and video quality from the 20 Megapixel Four Thirds sensor that rivals 24 Megapixel APSC sensors at all but the highest sensitivities. The composite High Res mode genuinely delivers greater detail with the right subjects, there's charging and power over USB, powerful wireless features tied together by Bluetooth, and Panasonic's cunning 6K and 4K photo modes that make it easy to capture a moment before you push the shutter or adjust the focus after the event. There's little to complain about: you get used to the very sensitive shutter release and visual fluttering during continuous AF, and while the ten minute limit to 4k at 50p or 60p seems mean compared to the GH5, who else even offers 4k at 50p or 60p at this price? Plus you still get half hour clips at 30p. In use you feel there's little the G9 can't handle and it's highly competitive at the $1699 RRP. Check prices on the Panasonic Lumix G9 at Amazon, B&H, Adorama, or Wex. Alternatively get yourself a copy of my In Camera book or treat me to a coffee! Thanks! Sony's Alpha A7r Mark III is a highly capable camera that's equally at home shooting high resolution stills as it is handling fast action or filming quality video. The 42 Megapixel full-frame sensor may be inherited from the Mark II but Sony's improved the processing to deliver superb quality. The ability to shoot at 10fps with confident autofocus makes the A7r Mark III surprisingly good at sports, and great for events or wildlife shooting too with its silent shutter. Movie shooters will enjoy good quality 4k along with 1080 / 120p for slow motion. Earlier concerns over battery life have been banished, and the camera sports improved controls, a more detailed viewfinder, twin card slots and even a touchscreen. The Wifi control also works well, complemented by Bluetooth for seamless location tagging. The removal of downloadable apps means Sony needs to find a way to implement interval and bulb timers, the touchscreen is underused, it would have been nice to have 4k at 60p, and only one of the SD slots will exploit the speed of UHS-II cards. But on the whole, shooting with the A7r Mark III is an overwhelmingly positive and impressive experience that will satisfy a broad array of photographers. Canon's EOS M100 is aimed at those upgrading from phone photography and as such needs to be easy and familiar while delivering better results and providing enough room to grow. It manages all that very well. It's compact enough to slip in your pocket and the simple controls mean anyone can pick it up and start shooting straight away. There's no built-in viewfinder, but the flip-up screen and great wireless connectivity make it almost as easy to shoot and share photos and videos as if you'd shot them on your phone. It has decent range of effects, timelapse movies and confident focusing for stills and video. Beyond that it offers the same 24 Megapixel APSC image quality as the more sophisticated EOS M6, the same fast and accurate Dual-pixel AF, 1080p video, and reasonable 6fps (4fps with Continuous AF) continuous shooting. Recommended for first-time camera buyers, but compare closely with Panasonic's Lumix GX800 / GX850 and Sony's A6000. Check prices on the Canon EOS M100 at Amazon, B&H, Adorama, or Wex. Alternatively get yourself a copy of my In Camera book or treat me to a coffee! Thanks! The Olympus OMD EM10 Mark III is a compact, friendly, affordable and feature-packed camera that'll satisfy beginners and more advanced photographers alike. It may at first glance appear to be a fairly minor refresh over its predecessor, the EM10 Mark II, but the upgrades greatly enhance what was already a very compelling camera. The Mark III not only gains very respectable 4k video, but now presents its wealth of advanced shooting modes in a much more accessible manner. Meanwhile it inherits the Mark II's viewfinder, tilting touchscreen, built-in stabilisation and excellent controls. The weaknesses remain the same too: it struggles to stay focused on fast subjects and the 16 Megapixel resolution sounds dated. If you mostly shoot static subjects though, the autofocus is fine, and the resolution is sufficient for most situations. So for general day-to-day photography, the OMD EM10 Mark III is hard to beat for the money. It's an attractive camera that's enjoyable to use and delivers great results in most situations with ease, while offering plenty of room to grow. Check prices on the Olympus OM-D E-M10 Mark III at Amazon, B&H, Adorama, or Wex. Alternatively get yourself a copy of my In Camera book or treat me to a coffee! Thanks! The Panasonic Lumix GX800 / GX850 is an entry-level mirrorless camera that's aimed at anyone upgrading from a phone or compact camera. It features a 16 Megapixel Micro Four Thirds sensor, interchangeable lenses, the ability to record Full HD or 4k video, has built-in Wifi and a touchscreen that flips up by 180 degrees for selfies or vlogging - and like all recent Lumix cameras, the GX800 / GX850 boasts Panasonic's array of cunning 4k Photo modes which let you shoot 8 Megapixel stills at 30fps and refocus images after the event. On the downside, there's no electronic viewfinder and the use of smaller Micro SD cards is a little unusual. More importantly, if you're unlikely to ever fit a different lens from the kit zoom, you could enjoy similar quality and features from one of the many premium compacts around with 1in sensors - such as Panasonic's own LX10 / LX15 - and these will also better squeeze into a pocket. But if you are wanting to swap lenses at some point, the Lumix GX800 / GX850 represents one of the most affordable points of entry around and comes recommended. Panasonic's Lumix GH5 is a worthy flagship body, greatly extending the quality and capabilities of the earlier GH4. A more detailed viewfinder, twin SD slots which both support the full speed of UHS-II, effective continuous AF at 9fps, and built-in stabilisation all make it a powerful stills shooter and the improved sensor and image processing delivers the best-looking images from a Lumix body to date. Panasonic's unique 4K Photo modes now operate at twice the speed or at 6K for extracting higher resolution stills from video clips. Unsurprisingly it's the movie modes which really impress with unlimited 4K video internally at 60p or in 10-bit at 30p (or both if you're using an external recorder), and a wealth of features including vectorscope and waveform displays, anamorphic capture, programmable focus transitions, optional XLR inputs and very flat output (especially with the V Log L update), all making it one of the most portable and professional movie solutions for the money. The GH5 is a no-brainer for video pros but also becomes a highly compelling stills camera too - Highly Recommended. Check prices on the Lumix GH5 at Amazon, B&H, Adorama, or Wex. Alternatively get yourself a copy of my In Camera book or treat me to a coffee! Thanks! The Olympus OMD EM1 Mark II takes the popular weatherproof Mark I, deepens the grip, adds twin memory card slots and employs the most generous battery of any mirrorless camera. It improves the already amazing stabilisation, adds a minor boost in resolution and offers a cunning composite mode which under the right conditions can increase the resolving power up to 50 Megapixels. The major upgrades though concern video and autofocus. The EM1 Mark II shots great quality 4k and Cinema4k video which work a treat with the stabilisation, while a new embedded AF system can genuinely track moving action at up to 18fps; switch to Single AF and it'll even shoot up to 48 RAWs at 60fps. It all adds up to a supremely confident and capable camera that can capture images where others can't, but you'll really have to need the 4k and or burst capabilities to justify the professional price tag. There's a lot of very compelling rivals for the same or less money. But if you'll exploit the feature-set, the EM1 Mark II becomes one of the most powerful and desirable cameras in its class and justifies its asking price regardless of format. Check prices on the Olympus OMD EM1 II at Amazon, B&H, Adorama, or Wex. Alternatively get yourself a copy of my In Camera book or treat me to a coffee! Thanks!